Raising a dog is not usually an easy task, yet of course we will never feel tired of looking at these cutey guys. To be honest, choosing which one is the cutest dog is mostly a subjective matter. Still, here we will try to include the cutest dogs favored by most people. So with no further ado, let’s get into the top 10 Cutest Dogs in the World 2017! *Note: This list is absolutely not definitive. Also, the dog breeds here are listed randomly and therefore, no breed is necessary “cuter” than the others. Beagle is a compact-size dog breed with friendly and very, very curious nature. These little guys often come in small or medium size, but always remember: they are originally scenthounds. 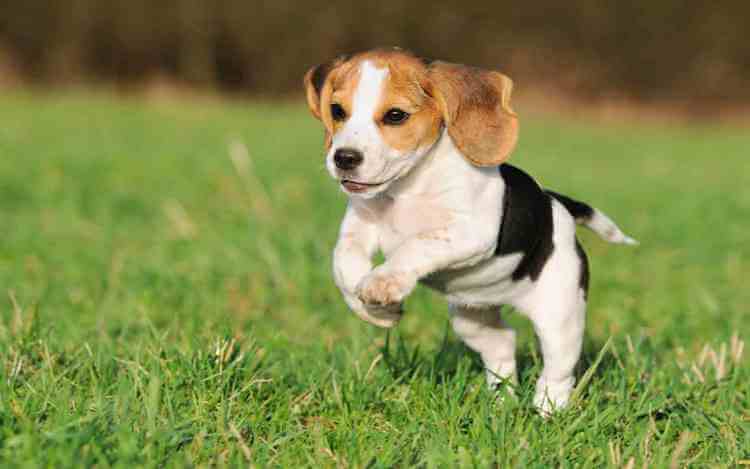 This means Beagle can be very playful, energetic, and most importantly, keen with their nose. The Beagle breed is blessed with exceptional scent picking. Their scent picking ability is so great that they are often trained to detect illegal items like weapons and drugs in U.S airports. Combining with their cute little appearance, passengers mostly don’t have any problem with these guys sniffing at their bags like other big police dogs. Another shining part of Beagle is that they are inherently pack dogs. This nature makes Beagle a really friendly companion with people and other pets, especially within family. That said; as a scenthound, Beagle is really energetic and it requires regular exercise. In addition, they are extremely curious with it comes to scent. They will most likely follow the interesting scent rather listening to their owners. But after all, that is their nature and that’s what partly makes them cute. Beagle is often considered to be difficult in housebreak training. That doesn’t mean they are bad dogs though. It’s just somehow they are slow in learning that. Other notable fact is that they are very energetic. They require regular training and if not, they can be pretty destructive. Due to the very same reason, they will come up with something when they are alone too long at home. This includes digging, howling, and even escaping. Food is also another thing need to be noticed. Since Beagle is very keen on the scent, they will sniff out food extremely quickly. And unfortunately, these guys don’t know when to stop when it comes to eating. Therefore, food regulation is required and also, remembers to keep our food securely. Talking about being friendly, definitely we cannot forget Golden Retriever. 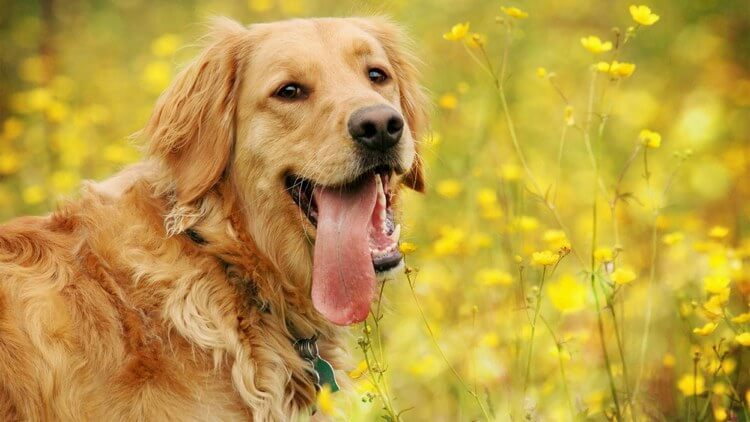 To this day, Golden Retriever is still among the top 10 most popular dog breeds in America. What make them so popular are their friendly, cheerful nature, high intelligence, and loyalty. The most notable thing about Golden Retriever is that they are extremely friendly. They prefer to accompany with human, making them a splendid family dog for even children. That said; these cute guys are kind of… childish. This childish trait is really cute for them when they are puppies. But somehow these guys can still retain this childish, playful trait even when they are grown up. It’s not sure how we should address this Golden Retriever’s characteristic. But certainly, sometimes we find this “grown-up child” rather amusing. Golden Retriever is originally trained to fetch fowls for hunters. Therefore, this breed is also energetic and they require exercise regularly. Traits: Intelligent, friendly, and devoted. Since Golden Retriever is loyal and they like to cling to people, it usually wants to please its master. Therefore, training a Golden Retriever isn’t difficult. Instead, what owners should care about is to give them exercises every day. These activities can be varied, including: walking, jogging, playing at the yard, running at beach or lake, and fetching. One thing to note though, these cuties love to eat and therefore, they can easily become overweight. For that reason, eating regulation is necessary. Also, please don’t expect these guys to be good guard dogs. They can even welcome thieves. These cute little guys can really, really distract us with their black, round eyes and their tails-wagging technique. Cavalier King Charles Spaniel is a true companion dog which is friendly and it loves to hang out with people and other pets. Besides their cute eyes and tails, the special thing about this breed is that they always cling to human. 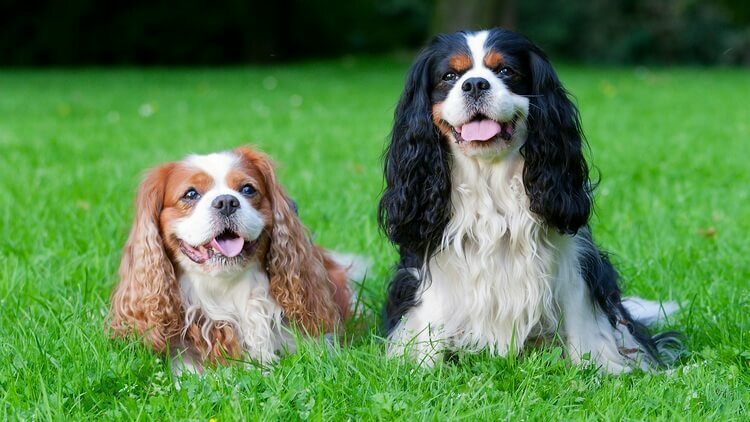 If you have Cavalier King Charles Spaniel in your family, you will never get bored because of being alone. This little guy will follow you everywhere which is a really adorable thing (unless you prefer staying alone). They also like cuddling in laps, but that doesn’t mean they are lazy. In fact, they still inherit the spaniel trait which is chasing birds, squirrels and other critters. Like Golden Retriever, Cavalier King Charles Spaniel likes to please its master and it is really smart. Therefore, we won’t have much problem training this cute little guy. With adequate food rewards and praises, they will quickly learn what they supposed to. Housebreaking training can be a bit difficult but that is a common thing with the toy breeds, including this guy. And so, the key is to keep training this guy regularly every day. As mentioned, the Cavalier King Charles Spaniel is also relatively active. That said; it doesn’t need rigorous exercises. Instead, a good walk can do a ton for it. Another thing to note, if you are not confident in resisting cute dog’s gaze, high chance your little guy will quickly gain weight. So, let’s be tougher and don’t please them too much. If you are into films, you probably know this fascinating breed already through the film Lassie Come Home. The Rough Collie star in this film even has her own star in Hollywood Walk of Fame. But as good as it sounds, let’s back to the breed. 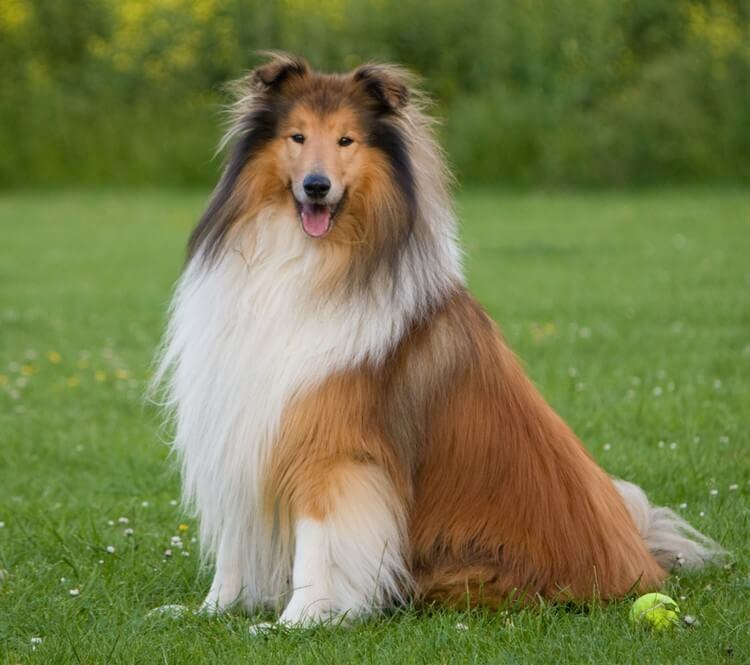 The Rough Collie originates from Scotland as herder and guard dog. Their main distinct appearance features are tri-color (usually black, white, and red), long face, folded ears, and double-long, thick coat. But of course, their appearance isn’t the only thing we are interested. The most special thing about them is that they are extremely intelligent, sensitive, and loyal. For those don’t know, there is a famous story of Bobbie the Wonder Collie which travelled 2,800 miles to return to his home at Silverton, Oregon (well, believe it or not, it’s true). Since Collie is still a born herder, it is quite active. Yet it can adapt well with different environment as long as it gets regular exercises. At certain occasions Collie may also attempt to herd pets and maybe children, so keep this in mind if you have children and other pets at home. That said; overall Collie has a friendly and loving nature. As a guard dog they may bark at strangers but that doesn’t mean she becomes aggressive. Thanks to Collie’s loyal and intelligent nature, they are quick to learn and easy to train. But since they are natural herder, supervision may be necessary when they are with other pets or children. They can also become exceptional guard dog as they are protective to their family. Especially with their outstanding sensitivity and intelligence, they can sense if there is something wrong and immediately react. Another good thing is that despite being active, if they get decent amount of exercise, they will be fine with relaxing at home for the rest of the day. If you are looking for a dog which looks good with accessories, Yorkshire Terrier may be your best bet. These elegant-looking guys are one of the most popular dog breeds in America and of course, for a good reason. 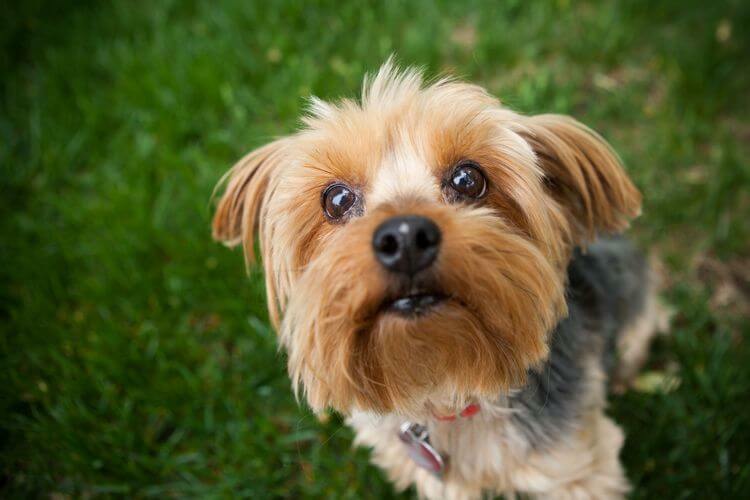 The Yorkshire Terrier is essentially companion dog which prefers to accompany with its master and family. They are definitely affectionate to their owners and they require attention and care. It is also interesting that they can sense the masters’ feeling rather quickly. Yet, they can also be sort of… jealous with other pets, especially new pets. Fortunately, they tend to get along pretty well with the surrounding environment as long as they get enough exercise. Overall, they may look difficult to take care at first, but they are actually splendid companion in the family. Let say there are 2 things we need to take notice when raising a Yorkshire Terrier. Firstly, they are quite difficult in housebreaking training. And secondly, they tend to yap or bark often at every sound. As the results, early and consistent training is absolutely necessary. If you are not confident in training them by yourselves, it is much recommended to consult professional trainers. Pugs… just calling their breed name already reminds us of their silly cute face with big, black eyes. 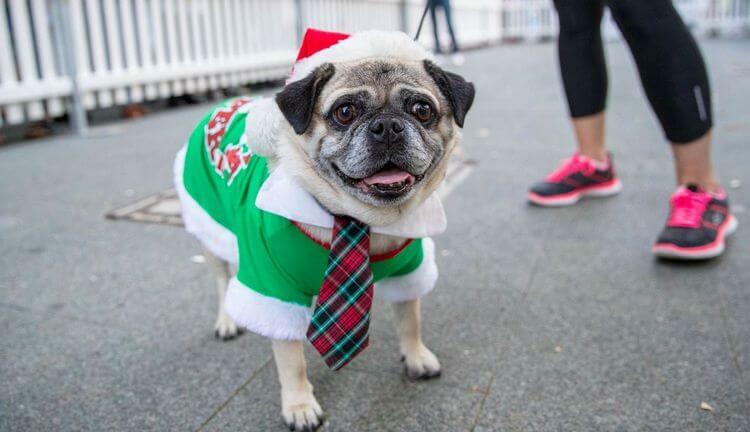 As a companion dog, Pugs like to be with their master and family and they also require attention. Therefore, please note that don’t let Pugs alone or they may have quite serious problem. But as long as you are able to stay with your Pug, it will be a splendid companion. While exercises do work well with Pugs, they are normally calm and quiet when staying indoor. Therefore, they are a good match for people living in apartments. That said; certain Pugs can be stubborn, making them quite difficult to train. Pugs are supposed to be relatively easy to train. Yet, certain Pugs are quite stubborn, making it hard to train them about housebreaking. Another thing about Pugs is their high chance of getting obese. As mentioned, Pugs don’t require much training especially if they stay indoors. However, their eating tendency can quickly cause obesity unless they have regular training or food regulation. “Fur ball” is probably the best word to describe the appearance of these little guys. 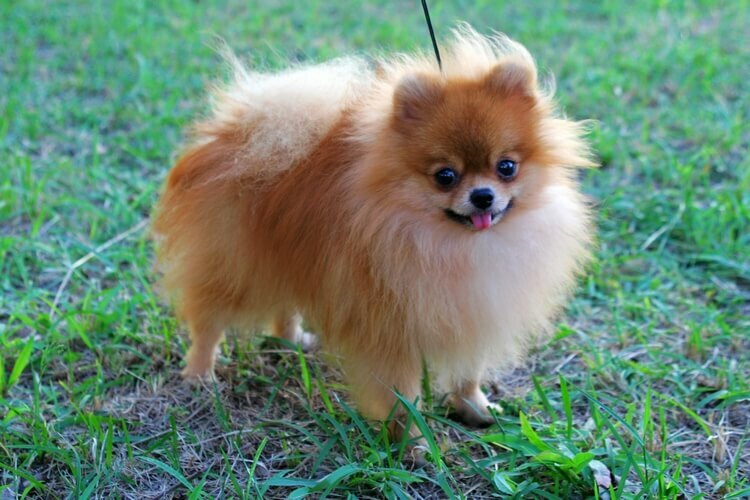 The Pomeranian has a really small body and weighs around 3 to 7 pounds. Yet despite their humble size, these guys are ball of energy and surely they like to play. It is said that Pomeranian originated from a large dog breed. And so we have to wonder if this “large ancestry” causes them to think that they are huge. Although they are small, they are willing to harass or even attack other big dogs (well, is this brave? Or foolish?). They also have loud barks, suitable to become a guard dog. For people who are busy or living at apartment, Pomeranian can be a good match due to their relatively independent nature. Pomeranians are smart and they are not exactly difficult to train. But here’s the thing: they are somewhat independent and proud breed. Therefore, they may not listen to people who they don’t acknowledge or consider highly. Their proud and bold nature can also make them feel that they are “bigger” than the owner if not train properly. Yet other than that, they are great family companion with proper and consistent training. As mentioned, some Pomeranians may have tendency to chase other dogs (including big ones) and bark at strangers. Therefore, early training is definitely necessary. But for the most part, they are pet friendly and they can get along well with other pet friends. 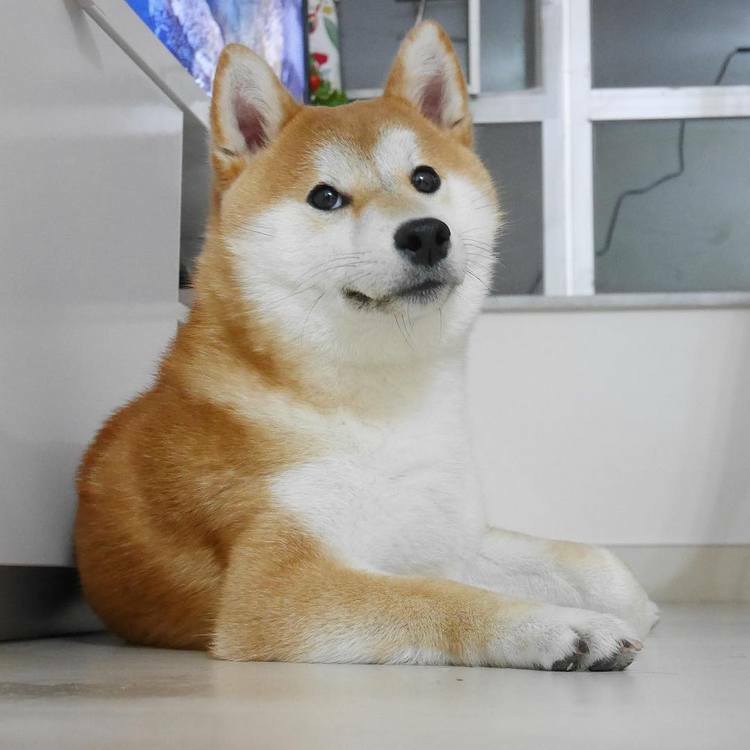 If there is a prize for the best “meme dog”, Shiba Inu is definitely the winner. This guy is the very dog breed which created the infamous “doge meme” throughout the Internet. It is also famous for its fox-like feature and fluffy face. However, if you are interested in raising a Shiba Inu purely because of their cute appearance, you need to think twice. Besides the “meme” and the fluffy cute face, Shiba Inu is notoriously difficult to train. This Japanese dog breed’s personality is like a cat. It is independent and doesn’t always listen to the owner. The Shiba Inu dogs are really, really smart… in sly way. They won’t listen to the owners easily and they even try to “trick” the owner to give them what they want, including making cute face OR giving out notorious cry. But besides their high training difficulty and independence, the Shiba Inu dogs are really affectionate and loyal towards their families. They are courageous and ready to protect their families, making them a really awesome family and guard dog. Needless to say, Shiba Inu is extremely hard to train and it is only recommended for experienced trainers. Due to the independent and strong-willed nature, Shiba Inu doesn’t follow the owners’ commands easily. It doesn’t mean that they are bad; it’s just their nature of being free. But let’s think again, the Japanese people must have some sort of “key” to raise Shiba Inu as they are so popular in Japan. Since Shiba Inu is quite cautious, early socialization is necessary to teach the Shiba Inu to get along well with other pets. Lastly, keeping Shiba Inu on leash while going out is never a waste due to their hunting nature. 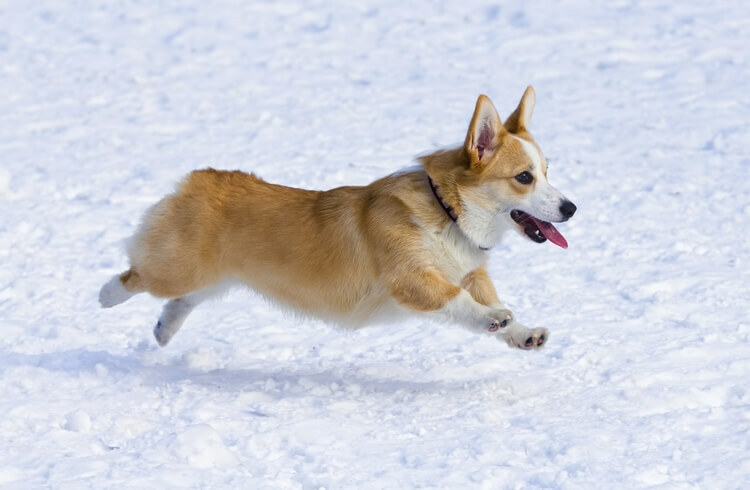 Having short legs isn’t necessarily bad, especially when it comes to Pembroke Welsh Corgi. In fact, that’s what makes this dog breed so cute and interesting. The Pembroke Welsh Corgi (or let say, Corgi for short, but don’t mistake them with the Cardigan Welsh Corgi) possesses a long body, long face, yet short legs. They are really cute… maybe in silly way but still really cute. But don’t forget that they are originally herders and that trait still sticks to them even now. Corgi is very friendly to human, other pets, and also children. They are playful and energetic in nature, yet they are also affectionate and attentive to their masters. Because of this nature, training Corgis are quite easy, given that they get regular training. Still, we need to supervise the Corgi when playing with children as they have tendency to herd the children. Other than that, they are splendid as companion dog in the family. Generally it is not hard to train a Corgi due to its attentive and smart nature. That said; regular exercise is necessary to keep these guys healthy, both mentally and physically. Finally on the list, we have a “butterfly”, or to be more precisely, Papillon. The name “Papillon” actually comes from the French language which means “butterfly”, referring to this breed’s butterfly-wing like ears. And of course, they are definitely among the most popular and cutest dog breeds in the world. Papillon has really long life span and they are really good companion in the family. They are affectionate to the families and they prefer being with their masters. This is definitely good news for many of us, but remember though, they are energetic in nature especially when they are puppies. Therefore, being lapdogs doesn’t suit these guys and instead, they prefer exercises. 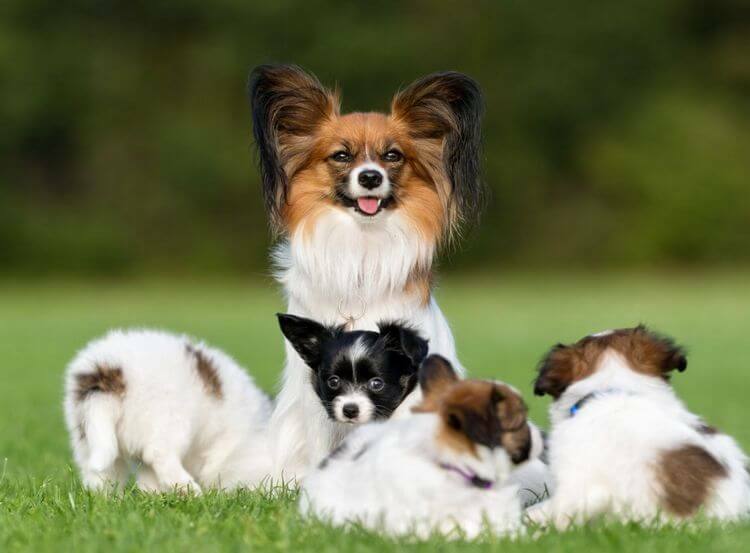 In addition, similar to the Pomeranian, Papillons are really bold, making them a suitable guard dog. Yet again, this bold trait often makes them forget how small they are as they are not afraid of other big dogs. Generally, Papillon is easy to train as they often want to please their masters and they always like to be with people. With proper exercise, they are fine with living in almost any environments. If you have small children at home, supervision is necessary. Also, early socialization can be necessary so that they do not become too alert. And that’s it folk! What do you think about these cute dogs? What is your top 10 cutest dog breeds? Feel free to share with us and for now, thank you and stay tune for more news in the future! Shiba Inu vs Corgi! Which One Makes Better Family Dog?